Writing Essays 3.o covers every aspect of essay writing – from note-taking and making essay plans to referencing and avoiding plagiarism. Learn how to write good introductions, use quotations effectively, and construct persuasive arguments. Suitable for all students in further and higher education. Includes a wide range of sample essays in humanities and social sciences. Runs in any Web browser. Latest version lets you customise your choice of screen fonts and background colours. Introduction This program will help you to write better essays. Your grades will improve. You will learn the techniques and develop the skills required for producing successful essays and term papers. The guidance is arranged in A to Z format. A brief review Analyse the question – Generate ideas – Choose topics – Reading – Selection process – Put topics in order – Arrange material – Make changes – Finalise plan – First draft – Paragraphs – Revising draft – Editing. 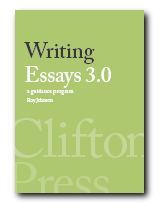 A good essay Answers the question – Clear structure – Appropriate style – Arguments supported by evidence – Shows clear thinking – Wide reading – Originality. Abbreviations Common abbreviations used in referencing sources and showing bibliographic details. Agreement How to maintain correct agreement between subjects and their verbs. Analyse questions How to recognise key terms and instruction terms in the question(s) you have been asked. Apostrophes How to use the apostrophe correctly in contractions and the possessive case. Arguments How to present your observations in the form of arguments supported by evidence. Bibliographies How to create and present a list of the works you have used or quoted from in your essay. Brackets The correct way to use round and square brackets in academic writing. Capital letters Where to use capitals in the names of people, titles, places, events, and institutions. Categorizing How to assess and organise the topics you are going to use in the construction of your essay plan. Checking drafts A checklist of what to look for after you have completed the first draft of your essay. It’s easy to forget details: a checklist helps. Colons The colon is used to introduce a list, or to separate two clauses. How to do it. Commas When and how to use commas in your writing. Conclusions A conclusion should draw together and summarise all the arguments in your essay. Dates The commonly used system for referring to days, dates, and seasons in academic writing. Editing A checklist to help you eliminate small blemishes and mistakes in your writing. Electronic sources How to cite correctly and give references from electronic sources in your work. Endnotes How to represent bibliographic information of works from which you have quoted, in a separate list of notes at the end of the essay. Evidence How to deal with the information you need to support your arguments. Exam essays How to produce essays under the pressure of limited time during an examination. Some tips and tricks. Footnotes How to represent bibliographic information of works from which you have quoted, in a separate list of notes at the foot of each page of the essay. Full stops How to use full stops correctly – and where they are not needed. Generalising How to recognise and avoid the common mistake of making general rather than specific claims. Generating ideas How to create the ideas and the arguments for your assignment – free thinking and capturing data. Grades How to understand the traditional systems of awarding grades to academic essays. Grammar checkers How to use them to improve the quality of your writing. Grammar Some basic guidelines for improving your grammar without learning complex rules. Harvard referencing How to use the popular Harvard system of bibliographic referencing. Hyphens How and when to use hyphens – and when they are not used. Instructions An explanation of the terms commonly used in essay questions and instructions – and what they require in your answer(s). Introductions How to get an essay off to a good start. It must be relevant, and it should be short. Jargon How to recognise specialist language – and understand where it is appropriate – and when it is not. Layout How to arrange and print your text on the page to make it as attractive and readable as possible. Length of essays How to stay within the word limit, and how to edit your work if you have exceeded the word count. Line references How to show references to quotations from plays and poetry. Moralising How to recognise and avoid the common mistake of unwanted moral judgements. Names How to represent the names of people, organisations, places, and events in academic writing. Narratives How to deal with subjects which involve a ‘story of what happened’ (history, fiction) without getting lost in events. Numbers How to represent the numbers of things mentioned in an essay. Paragraphs How to create the structure and arrange the elements of an effective paragraph. Plagiarism How to understand plagiarism, and avoid it by acknowledging your sources. Planning essays Analyse the question – Generate ideas – Choose topics – Arrange order – Provide evidence – Make charges – Finalise plan – Check for relevance. Sample plan. Presentation How to maximise the visual impact of your essay by using margins, white space, headings, line-spacing, and emphasis. Punctuation The basic rules of punctuation, plus guidance on using marks such as the dash, hyphen, oblique stroke, and quote marks. Questions Do not pose your answer in the form of questions. In fact do not raise questions in essays – unless you are going to answer them. Quotations How to quote from other people’s work in your essay – and how to make sure that your quotes are tied back accurately to bibliographical citations. Re-writing A checklist for re-writing your work to improve its quality. Research How to decide on the amount of research your assignment requires – at various levels. References How to show bibliographic references in your work, using traditional systems. Repetition How to avoid repeating the same names (people and places) and key words. Rewriting How to improve the quality of your essay by editing and re-writing it before submission. Searching How to use Internet search engines to locate materials and information. Semicolons How to understand the semicolon and use it correctly. If in doubt, don’t use it. Sentences How to create simple and effective sentences. Follow the simple Subject – Verb – Object pattern of writing. Signposting Avoid heavy-handed signals of intent in your essay. Let your arguments speak for themselves. Spelling checkers The strengths and weaknesses of spell checkers, and how to use them. Structure The importance of good organisation – and how to create it in your work. Style A simple prose style will help you to avoid the problems of over-complicated writing. Taking notes How to take efficient notes when reading, listening to lectures, or watching videos. An example of a good set of notes. Tenses How to choose the right tense to discuss a text and describe events from the past. Titles How to show the titles of articles, journals, newspapers, magazines, films, and books. Tone How to create a persuasive tone for an essay, which is engaging but not too personal. Topics The relationship between your chosen topics and the structure of your essay. Tutor comment Learning from the comments a tutor may write on your essay. It’s valuable feedback. Word-processors How to use the power of a word-processor to improve the quality of your work. Writer’s block Seven effective techniques for getting words onto the page. Recognising the type of block. How to generate more text. Writing strategies Six different approaches to composition – from improvisation to cut and paste.